The French daily Le Monde published a report on anti-corruption protests held on Sunday by Brazil. According to the newspaper the people did not join in the same way as before, at the time of the impeachment of former President Dilma Rousseff. Monde adds that despite this the local newspapers continue to show interest in the repercussions of Operation Lava Jato. 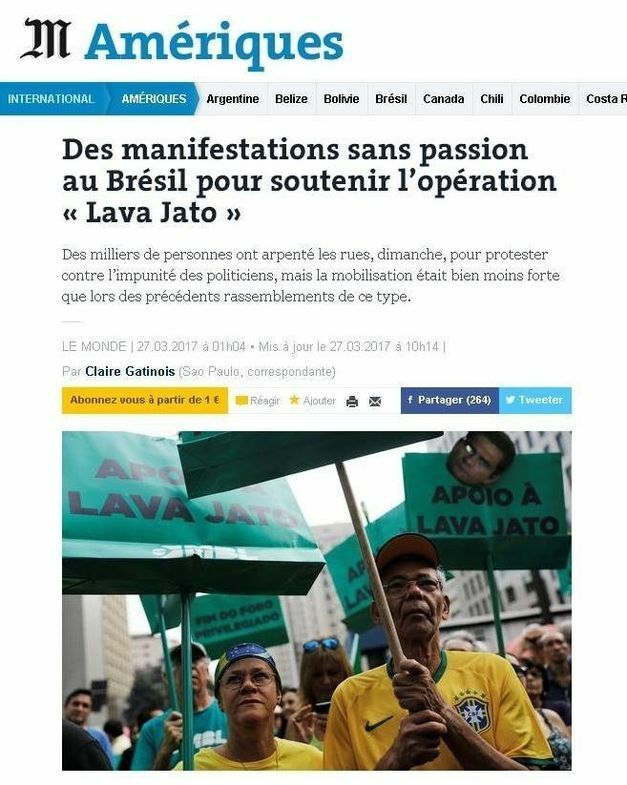 With the headline "Manifestations without passion to support Lava Jet", Le Monde reports that the Brazilians were called to the streets by the same movements that organized mass marches to defend the impeachment of Dilma Rousseff. The news highlights that the goal was to show that the fight against corruption has not come to an end, but the result was well below expectations. The text affirms that the demonstrators were few in São Paulo, Rio de Janeiro, Belo Horizonte and Brasilia. Another factor pointed out by the Monde is the radicalization to the right, which can be a consequence of a feeling of disappointment and disgust of those who supported the impeachment. The latest revelations from Lava Jato show that both the left and the right - from former President Lula to President Michel Temer, to Aécio Neves and Governor Geraldo Alckmin - are being denounced. It is then necessary to find "the ideal candidate". To conclude, the newspaper said that Judge Sérgio Moro, considered the demonstrators, has not yet decided whether to embrace politics, and while he thinks, the name on the rise is that of the mayor of São Paulo, João Doria, who conquered the Paulistas with Its apolitical image.